Crazy Crocheter: Mouline Yarns, bonsai, and a new project. After getting sock yarn at “La Tricoteuse” I was excited about discovering more Montreal’s yarn stores. A fast Google search revealed a list of at least 10 stores spread all over the city, from East End and Plateau to the West Island. The closest ones to my house were “Ariadne” and “Mouline Yarns” located at a walking distance from the Lionel Groulx metro station. I decided to start my explorations with “Mouline Yarns”. The reason was purely materialistic – they were having a big Spring sale and who can pass discounted yarn? The first thing that surprised me was the amount and the selection of yarn. It seemed like each corner of the store was holding more and more surprises. Loyal to the advertisement, most of yarns were reduced, some to as much as 50% and 60%. The shelves were stacked with yarns and topped with different garments knitted with the presented yarn selections. Scarves and shawls, socks and mittens, baby sweaters and full-sized adult tops decorated every surface of the store. It is nice to be able not only to see the yarn, but to touch the final item, to know how the colors would look like once the sample is knitted. Apart from yarns, the store also carries the greatest selection of knitting and crocheting books and magazines – this was the place where I spotted the first North American issue of "Verena" magazine. I asked the owner (Svetlana, yes she speaks Russian, as well as fluent English and French) about lace-weight yarn and showed her the pattern from “Knit1” magazine. As it turned out “Mouline Yarns” had exactly what I needed: sea silk in different vibrant colors. Unfortunately it was a bit pricey for me and I asked for any acceptable alternatives. Svetlana offered several yarn varieties and explained how many skeins I would need and why one type would be better than another. I chose beautiful Baby Alpaca yarn (from Misti Alpaca) that was very affordable and picked two skeins of a nice "Blue Mist Melange" color (CD 42). 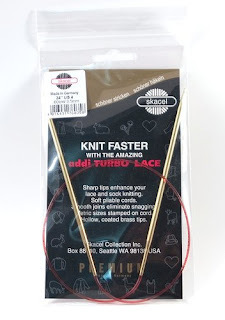 I also picked up a pair of Addi Turbo lace needles that Svetalana recommended. Sensing my “newness” to the whole knitting business not only she explained to me that the yarn had to be rolled into balls before knitting but let me use the yarn winder, patiently showing me how to mount the skein, find and cut the nod, and attach the end to the rolling part. While rolling the yarn I witnessed numerous customers coming to Svetlana with different questions and she would recommend yarns, explain patterns, or simply give some advice. I couldn’t not come back to the store again and soon after finishing my socks I came to “benefit” from some yarn specials – but this is a different story. The store offers different workshops and lessons. Call (514) 935-4401 to enquire about the summer schedule. 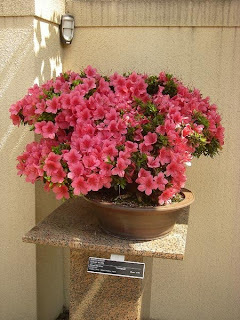 It has absolutely nothing to do with knitting but I wanted to share this picture of one of the goregous Bonsai trees from Montreal's Botanical Garden. If you are in Montreal check out the Japanese Garden and Pavillion of Jardin Botanique. 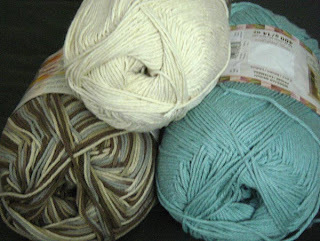 I am using 3 different "Bernat" colors: Off white (00002), Boston blue (27201) - part of their "Colonial colors" collection, and Earth Ombre (33048) - part of "Naturals" collection.